The idea for this Sliding Compound Miter Saw is to replace the space hogging radial saw. I did not get a super deal on it mainly because the saw blade is completely shot. Of course I did not find out about this until I took it home. I bought this saw used through Craigslist for $200. That is a great price considering a brand new one at Home Depot cost $569 plus tax. Here is the story, this guy originally was asking $300 for it on his ad. I gave him a call and ask if he is willing to take $250, and he say yes. So when I arrived to take a look at the saw, it did not look like he only used it 3 times as he claimed. But that is fine because it is not in bad condition either. Next, I find out that the lower blade guard is not working properly because the link actuator is severally bent out of shape. The good thing is none of the problems will affect the performance of the saw and everything can be fixed without buying anything. Like all used items I buy, I usually point out all the bad stuff so I can reduce the price a little more. In this case I was able to knock off another $50, to make it a total of $200. I am glad that I got the extra $50 off because I ended up needing to buy and new blade. Through amazon.com I was able to get a Freud D1244X Diablo 12-Inch 44 Tooth ATB General Purpose Miter Saw Blade for 31.74 shipped. I bought this miter saw to replace my larger Radial Saw because it was taking up too much space. 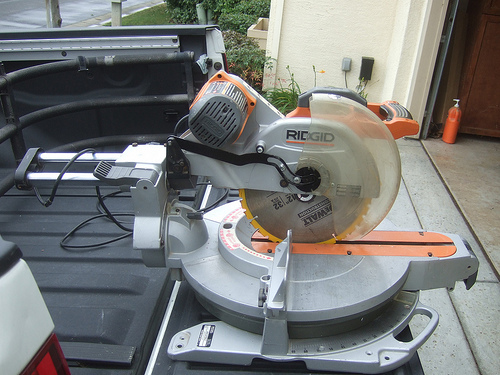 I was also able to sell my Ridgid Radial saw with the HTC base for $220. That is not too bad, since I bought it for $175 and used it for 4 years. 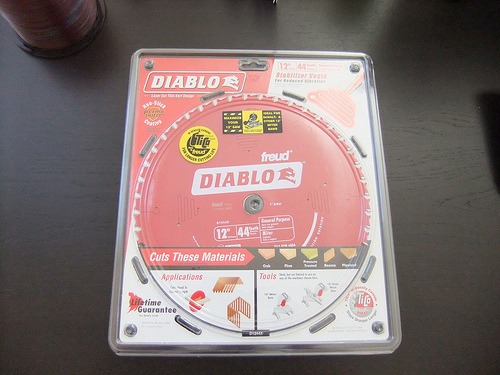 Through amazon.com I was able to get a Freud D1244X Diablo 12-Inch 44 Tooth ATB General Purpose Miter Saw Blade for 31.74 shipped.